Squarespace review revealed 17 important hidden things those you should know. Before building a website with Squarespace, If you read this full post, you will understand clearly ⇒Whether Squarespace website builder is for you or not? Before 17 things, just fly on these all reviews. Let’s see whether Squarespace will suit you. Is Squarespace a Good Company? Before choosing any service, you should know its trustworthiness prior to its quality and features. Let’s check. How Are Squarespace Most Of The Visitors Coming? Here are the exact ratios. 31% traffic is coming from Referrals..! This is not a good sign. If you see Wix, its referrals traffic is just below 2%, But Squarespace getting 31% of its traffic every month from its referrals. Its returning visitor ratio is very low. Most of the people don’t continue with Squarespace. Squarespace User Growth – Are Its Customers Leaving Or Continuing With Satisfaction? If the user base is decreasing, then you can assume either people are not satisfied with Squarespace OR more superior quality services are available on some other companies (say, its competitors) than Squarespace. So you can conclude That’s why they are leaving and transferring their websites to another website builder or vice versa.Let’s see. From the above graph we can conclude people’s interest in Squarespace is increasing over time, But At Present its interest in the internet is not increasing. Squarespace User Experience – Will It’s Website Builder Easy For You? Or Give You Many Problems? Will Squarespace make you some difficulties? Can anyone able to make, run, modify and grow their website on Squarespace? How Easy are its website builder and other all settings? How is overall user experience? Who Visits Squarespace? Is It Really Easier Than Other Website Builders For You? Is Squarespace Website Builder Easy For Your Level Of Skill Or Knowledge? Very simple. If we track what type of people are using Squarespace, then we can conclude whether Squarespace is for only kids or college students or techies or web developers. Squarespace usage review. Is it easy for you. Who visits Squarespace? In “School”, it is using very less. For example, In Wix Review, We got “No college” & “School” Category ratio is more than the rest. So we can conclude Squarespace is little difficult. Because most of the School Students & “No College” people use the easy one. If they found difficulty, they will leave and find the easy website builder. I am not saying Squarespace is very difficult. You can try it. Just reviewing Audience demographics will not tell you everything. Let’s see all below topics. Let’s walk through on Squarespace complete website creation process quickly. You need to sign up for Squarespace. After you will see to choose templates just like other website builders. After selecting your template, your site builder will load. You need to again enter your email and the password. After you entered, you will see the real picture of Squarespace. Squarespace claims, it is a drag and drop site builder but in our review, Squarespace is NOT a fully drag and drop site creator Only you can drag and drop blocks. That’s it and nothing else. You can’t move wherever you want. It will not make you cool while you want to resize or move blocks. The below screenshot I took while I am moving a block. Squarespace Site Builder editing page Moving blocks will make you get irritated. You can edit, delete, upload media etc. But there are so many restrictions. For example, you can’t make more than 20 pages with the $144/year plan. You need to upgrade $216/year for creating 20+ pages. It is too costly relative to other site creators. Once you edit your website, you need to upgrade. Otherwise, your website will expire after 15 days. Only they give 15 days from the day you created your free account. It is very short time comparing to its competitors. Only after you paid, your website will appear on Google and other search engines. How Is Squarespace Control Panel, dashboard & Other Settings? Squarespace doesn’t have a particular dashboard. Site Builder is not so easy like its competitors. This is NOT a fully drag and drop website builder. You can’t easily move blocks wherever you want. You can’t easily resize blocks. You need to add spacer then you need to drag spacer to beside the blocks you want to resize. After that, you can resize. But if you want to resize and bring it to center, you need to again add a spacer to another side. And again you need to resize. It is completely unscientific processes. It does not look like a professional work. VERY SLOW. Sometimes you may get angry because of its slow responses. Sometimes, you can’t understand where you are editing. You will not get any dashboard to manage all your website main task from one page. It takes a lot of time to know how its website builder & other settings work. Most of the settings & customization options, you can’t get easily even you know well about web creation. Squarespace Templates & Designs – Is It Really Good Enough? Are Squarespace templates are really designed with modern techniques? Is it developed with good codes? How Good Are Squarespace Templates And Designs? How to measure a template? How to know a theme is good or bad? We did all tests. Let’s check it. It means how amazing are its templates to see. I already inserted Squarespace template screenshot on User experience section. Here you can preview any Squarespace templates. Really Squarespace templates are very impressive with the modern look. Our test revealed templates are created smoothly with a highly creative design. But Just Looking at the templates, we should not believe either it is good or bad. Reading our Reviews, tests, Comparisons & expert’s opinions can make you perfect. Squarespace Template Structural Data Test – Is Its All Themes Are Developed With Good Codes? You no need to be a software programmer to know this. We did all tests. Here is our short & quick understandable analysis for dummies. Then I tested it’s Structural Data & Architecture. See the result. After that, I tested all 21 Squarespace Templates. All Templates are developed with good codes. If you want to build an amazing website, this is very important. Let’s see, What about Squarespace theme customization? Theme Setting Included these main options. Some Important Squarespace Settings & Customization Options Those You May Searching Right Now..!! It is similar to WordPress Theme Customization. All important settings are available in the front end. So it is easy to make changes at any time. Custom WYSIWYG Editor supports complex multi-column layouts. Custome lock-screen, Custome codes, Custome Favicon, Custom site search engine, Many types of comment system & so many blogging customizations available. Layout engine gives you the real power of theme customization. Theme Customization has included all important and advanced options, This gives you make stunning websites according to your dream. Customization Tab & Preview is on the same tab. Once you make changes, Automatically preview will show on the right-hand side. You can view Your website in Mobile mode, Tablet Mode & Desktop mode in the same tab. This lets you save a lot of time if you are very concerned about all device view of your website. 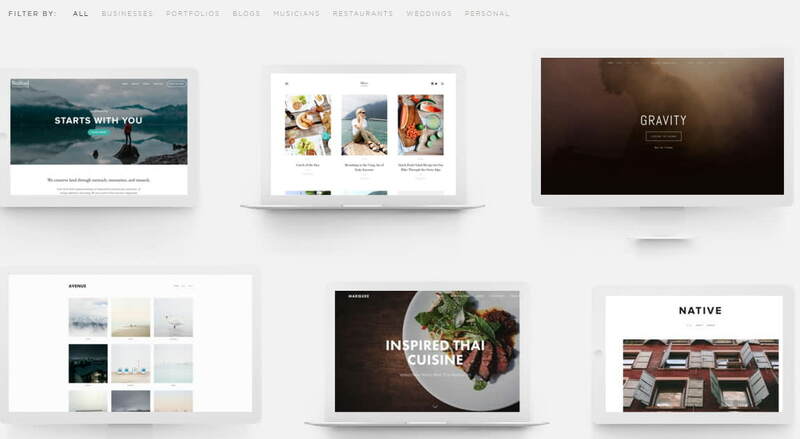 You can learn everything about how to make a stunning website with Squarespace for free. Watch free Squarespace Video tutorials. Videos included from getting started to making amazing websites. Squarespace Design Options & Flexibility – Will You Get Full Freedom? Do you want to make your website stand out from the crowd, right? Then you need a lot of design options & flexibility. Because Every website builder gives you 500 to 1000 templates. Those designs are using many people. If you make the same design, it will not make Awww…..!! the situation when a user enters into your website. Find Here New Squarespace Designs. Take a Look at Squarespace Design Options & Flexibility. Squarespace design options & flexibilityHere you can learn Sqaurespace Template & Design tutorials. Managing Image in Squarespace is very easy. Gallery & Image manager will help you make many types of designs & setting. You can import & export images. Drag and Drop function will make easy to edit photos. Squarespace Image Management is easier like image gallery or all media sorting etc. You can change your design in a single click. logo image, browser icons, social share with logo, website title all options are available. Separate Automatic Squarespace Logo Creator, you can create amazing logos in the minute. Style editor options & flexibility really gives you the power to change anything in a minute. You can change any colors anytime in a single click. Squarespace template Design Color options. You can change a background, navigation, hover effect, transparent and every element colors. Squarespace info page styles very usefully to make amazing pages in a systematic way. Squarespace template design info styles included many options. Images drag & drop option is really useful for beginners. But Squarespace does not have a vast number of design customization & options like Wix. You can’t drag & drop all its text & other content. Only images have this feature. If you don’t satisfy its design flexibility, you can get Squarespace designers. But you need to pay them. For Flexibility test, Wix got more favour ratings than Squarespace. In our Squarespace Design flexibility, We found sometimes bugs are connected account & E-commerce flexibility. In overall, Squarespace got a good rating from our team. Squarespace Mobile-Friendly Test – Can You Able To Make Responsive Website? Squarespace Itself is saying all its Templates are mobile friendly. If we see Squarespace templates, we feel it is mobile friendly. I tested various devices. See this photo. All Squarespace templates are Mobile FriendlyI tested all templates. From the above test, we can conclude Squarespace templates are responsive. But Squarespace Templates are really mobile friendly according to Google standards? I picked a Squarespace customer’s website randomly( www.thecarcrush.com) You can see this website on Squarespace Customer page. Then I tested Is it mobile friendly according to google standard. Squarespace Customer ‘s Website google Mobile Friendly test passedGoogle declared – Awesome..! This Page Is Mobile Friendly. I tested many templates & Customer’s websites. All websites are passed google mobile-friendly test. So I can confidently say, All Squarespace templates are Mobile friendly. You can build a solid responsive website with Squarespace. Squarespace designs are modern and look like a professional cut-out. You can change templates without losing your previous data. Squarespace theme customization & settings are very bad. You need to fill some fields. That’s it. You can’t change settings as your imaginations. It is very narrow setting. Squarespace Website Builder Features & Functions – Here, Can You Really Able To Make Anything You Want? We reviewed systematically observing all the features & Comparing with Other Website builders like Wix and CMS like WordPress. Note: – You can change or Switch from your template to any template without losing your uploaded contents. Main Important features of all templates are really helpful you to build any type of websites. See this template. Squarespace Main Features are available for any page and any template. If you want to sell something, You NO need to select Online store templates. Because Every Template allows you to sell anything…!! But If your purpose is to sell only, then select online store template. If you clicked on the products Icon, You will see this. You can sell or make business using any templates. You can sell physical or digital products. Also, you can design your website to collect payments from your services. Its E-Commerce SEO(Search Engine Optimization) really good. Image Thumbnail, Navigation Title, Page title, Description, Tags, Categories and more options make your product visible to all search engine and it will boost your SER(Search Engine Rank). We Review carefully All E-Commerce functions. Finally, we got a good result. Below this section, you will get the overall rating in percentage. For every type of website, Blogging is essential. We reviewed briefly about Squarespace blogging. All Blogging Essential Features are there. So, If you wanted to write blogs, you can do with Squarespace. Above screenshot shows you a view of blogging options. For typical blogging, Squarespace is good. But you can’t run professional blogs reliably. We reviewed and tested the following features. In all category, Squarespace blog features are good. Even you wanted to become a blogger with an amazing website, this is a good enough. Here you can get stunning designs. Using Squarespace cover pages, you can build a quick website. If you wanted to launch something Or you want to create a website for your upcoming events like baby naming ceremony, you can use this. You can also use this for landing pages in your website. For example, If you want a separate page for your homepage or you are focusing only one thing on a page to increase conversion rates, Then Cover page is the best solution for you. Cover page advantage is Single page website with very Quick editing & it will help you to targets high focussed single items per page, So conversion rate will increase. You can add infinite pages. You can create folders on your website. Album & Galleries are very useful. Events function included more features than it’s competitors. Totally Squarespace template major features & functions are really good. Squarespace connected accounts for location & codes. This is very useful. You can design mobile and desktop page at once. See this photo. Squarespace Mobile information bar is responsive & quick. It will display contact number, location, office hours, map etc in a systematic manner. Many Squarespace template has separate style editor options for mobile website view. Squarespace template has a separate mobile style option. You can disable any styles or promotion blocks, if you don’t want. You can add a different background for a mobile website. That means if you will see different backgrounds when you open your website in desktop & mobile. You can add a different background for mobile users. So you can optimize designs for the small display. Totally Squarespace templates have many options for the mobile website. In all-out the test, Squarespace performance is excellence. So we can conclude Squarespace maintained perfection in its website template responsiveness. Our Review team checked whether Squarespace theme customization & Setting have all essential things. You can write your Basic information. So that search engine will recognize your site easy.It included business name, address, tax registration ID (If you have), Contact phone number, email, Office location & your office hours. You will get many advantages. If a person searches in google, he will get all your information very quickly in a systematic manner. So conversion rate will increase. If you want to add a mobile bar, you can add your phone number, email, location, office hours. If a person on your website from a mobile, he gets all information quickly. If a user just taps on your contact number icon in the mobile bar, it automatically calls you..!! Regional will help you set your time zone. It will help for international communications. Permission is an important option. If two or more people needed to contribute to a single website, you can give separate permission or passwords to each of them. The real owner can get all the information of everyone’s activities. You can invite many authors also you can transfer your website ownership. In billing & account, all your invoices & other important documents are available. Here you can switch your product. You can get a domain name from Squarespace or you can buy domains from different companies or you can use your old domain names. You can use google apps. Professional email, online storage, shared calendars, video meetings and all your need in every step can help google apps. Separate SEO option shows, how Squarespace is giving important to all aspects of online solutions. In SEO description writes about your website with a rich targeted keyword. For example, I created a website & its name is DuckToLuck.com. Its tagline, How To Turn Your Money Journey From Duck To Luck. (I mean – Duck Means no skill or no money & Luck means Success or a lot of money) My Website Description is “Are you a duck man? Visit DuckToLuck.com. Get New business ideas, Start Up tips, Make money online, Make a website and more guides, Experienced opinion, Experts Interviews & Live how to videos ” My target keywords are starting a business, Make money online & make a website. That means those who search for those words are my targets. So I included all my target keywords. For Marketing & promoting, separate sections are built in with Squarespace Settings. Stripe is inbuilt with Squarespace for e-Commerce purposes. You add PayPal by copy-paste codes anywhere. But shipping details are very poor. In our review, Shopify has more advanced than Squarespace in Overall e-Commerce features. Metrics is one of the important options. Using this function you can know all about your website such as, how many people visited, which is the most popular content in my website etc. You can also view your all log activities, Subscribers, Search Queries, mobile usage and much more. You can manage your website from your mobile using Squarespace apps. Mobile information bar and mobile styles give you the advantage to display your website on small devices effectively. You can manage your website from your mobile through Squarespace IOS or Android Apps. Only one sub navigational level. You can’t make navigation as a deep sub level. In these days, almost all website needs deep navigations. Everywhere you will see the limit. If your imaginations are higher, then it may make you angry bird. It is not good for other than the English language. Because the editor only supports multilingual, but website all interfaces are English only. Squarespace doesn’t have any 3rd party App stores. It is one of the biggest limitations. You need to design your website using only a few apps those may not fulfill your dreams and needs. It will take a lot of time to get to know how Squarespace works. Even though, those are not superior features than its competitors. Squarespace eCommerce Review – Can You Able To Make Your Own Online Store Without Any Problem? We made a separate review for eCommerce. Because just creating a website and building an online store is entirely different. You may say, it is the same. But to start an eCommerce business, you need to know all the tools, applications & important things. E-Commerce builder tools, services & website builder tools, services rating & reviews usually we get different. If you want to build a website, you no need to know anything about its online store pros & cons. That’s why we made a separate review for it. Squarespace Security – Will It Able To Protect Your Debit/Credit Cards & Websites From Black Hat Hackers, Viruses & Malwares? Squarespace website security test showed it is too dangerous to host. Because it is open for heartbleed vulnerability. I think it is using very cheap antivirus for its large hosting. Squarespace is not too safe. It is open for Heartbleed vulnerability. Remember, It is Too Dangerous. In most of the cases victim’s credit or debit card informations were stolen. heartbleed vulnerability is a serious bug, if you get exposed to it, Squarespace can’t protect you. Because their SSL is not good. Do You Get Professional Emails? : No. (It means, the email ends with your domain name instead of gmail.com or hotmail.com. E.g My email is jack@websitebuilderly.com and no one can create emails using my domain name. all emails that end with websitebuilderly.com are I already own..!) You need to buy professional email from somewhere else. People believe always professional emails. Because, if your email ends with gmail.com, how to believe that’s you? You don’t know the internet is full of spams, scams, frauds & hacks? Backups: You can take your posts, media and entire website backup. If your website get expired, they will store your backup upto 30 days. Import & Export: You can transfer your website from any platform and in the same way you can migrate your site from Squarespace to any web hosting company. Squarespace website speed test revealed how worst is its loading time & performance. From the above result we can conclude, if you want to make a fast loading websites, Squarespace is not for you. It is very slowest website builder in our tests (We already tested 100s of services). Squarespace Support – How Is It? Squarespace doesn’t give you 24X7 support. they don’t offer phone or internet call or any direct support. If you go Squarespace Support Page, You will get all solutions for your problems. Only 21 Squarespace templates are available for free. If you don’t like any designs, then have a chance to get help from Squarespace designers & Specialists. Click here to know Squarespace Specialists. There are 100s of Squarespace Specialists, developers & Designers are working & waiting to solve Squarespace Customer’s Problems. You can hire them. But you need to pay them according to your needs. Some Specialists charge by hours. There are all ranges from $45 to $15,000 per project. You can watch Squarespace free video tutorials. You can ask the question in Squarespace Answer section. Squarespace hosts often its Workshops in the different location. Squarespace Help & Tutorials – Is it explains everything? No. However they covered all essential tutorials. You will get some answers in their forums. But forums are the waste of time. I am not saying it is a waste, sometimes you will get the right answer, but you need to read all unwanted discussions. If you see their customer’s review, you will get the real answer. See below. What says Squarespace paying subscribers? Let’s see some third-party review sites. Squarespace reviews from its paying customer showed very poor ratingsSquarespace got very bad reviews from its customers. Just 3.6 points out of 10. That means 1.8 stars out of 5. With 140 reviews…!! If 10 or 20 reviews got, We can say, this review may unreasonable. But 140 review. We should consider this. But, Don’t Decide on only customers reviews. Because Squarespace Have its Customers from Big companies & Top Celebrities. Squarespace Pricing – Is It Worth For You? Squarespace is too costly with fewer features relative to the other best website builders. It is not even technically better than Wix or SiteGround-WordPress. Squarespace plans starts from $144/year or if you want to pay monthly then charges increases to $12/month to $16/month. For online store, price starts from $30/month. I hope, Now you got the smell & taste about Squarespace. If you want any personal advice or you got any doubts, leave your comment below. Within 24 hours, you will get my response for you. Build your website with the right one, get success and cross your dreams. All the best.